In 1971 I founded Mugwumps Instrument Herald to provide a central place where people interested in folk music could buy, sell, trade and learn about the musical instruments on which the music was made, namely banjos, guitars, mandolins, ukuleles, autoharps, ukelins, zithers, glass harmonicas, kazoos, and anything else I felt might be of interest to readers. In the beginning, I sent a flyer to everyone I knew who was interested in the subject. Also, two friends of mine, Tom Morgan and Reed Martin, lent me their lists of friends. That group mailing was the start of Mugwumps Instrument Herald, shortened before the first issue came out to just Mugwumps, which is now Mugwumps Online. Bob Clayton was subscriber #1. Reed Martin allowed me to photograph his Gibson harp guitar for the front page of V1#1. Over the years, Reed, Bob, and Tom have each remained staunch supporters and good friends of mine and of Mugwumps. The magazine grew to become a respected journal for collectors and dealers of vintage, mostly fretted and stringed, musical instruments -- banjos, guitars, mandolins, etc. The instruments we wrote about were generally American made during the period from after the Civil War to just after WWII. There were profiles of contemporary instrument makers and one third of the magazine consisted of classified ads submitted by subscribers, for instruments, books, parts and supplies. I revived Mugwumps as an online magazine in 1997 . At first, I published some of the best articles from earlier issues, but I soon added classified ads, new articles about old instruments, profiles of contemporary instrument makers and tips & techniques for repairing, and maintaining vintage instruments, and building new ones. The word Mugwump dates from the election of 1884. Members of the Republican party refused to vote for the party's nominee, James G. Blaine. Loyal party members said such a person was "a bird with his 'Mug' on one side of the fence and his 'Wump' on the other." 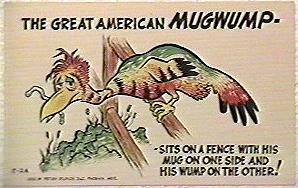 Below is a postcard showing the Great American Mugwump. The word has come to mean a non-conformist. I said that Mugwumps magazine was for those people who didn't go along with the trend to electric instruments. 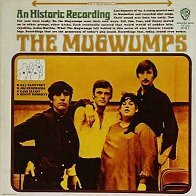 In the Algonquin language, Mugwump means "a great man." Some other uses of Mugwump have surfaced. Before they were the Mamas & Papas, members of the group performed under that name -- you can hear the name mentioned in their song Creeque Alley -- and the "MacIntosh Users' Group" has used the acronym. There is also a computer game by the same name.